We are a leading Manufacturer of v banner standee, double banner standee, door frame standee, x banner standee and wooden easel stand from Ahmedabad, India. 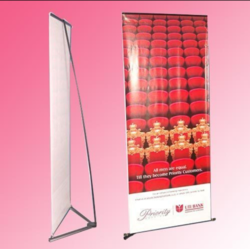 We Provide Good Quality Of V Banner Standee. It will be Easy to Install and Uninstall. Aluminium Body with double side banner Standee. 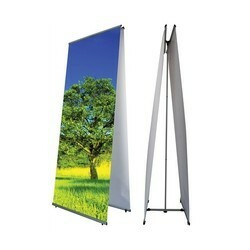 It will be Generally used for Indoor Advertisement. Type Foldable & Easy to Install. This is Good Product for Outdoor Advertising. Make with Powder Coated MS Plates. Packaging Details: 5 Pieces In cartoon. We have good Quality of X Banner. in 2x5 ft. And 2.5x6 ft.
Make With Wooden and Good For Outdoor Advertising for PVC Foam Board. Looking for Banner Standee ?